An elegant brewer for those who want to perfect the pour over method. Great for obtaining complete control over brewing extraction. 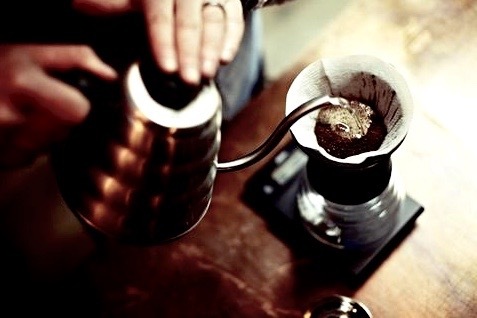 Pourover brewing is the ultimate in malleability for adjusting the brew to suit your tastes. Our V60 technique starts with rinsing the filter and placing it inside the cone. We add the ground coffee and level the bed. 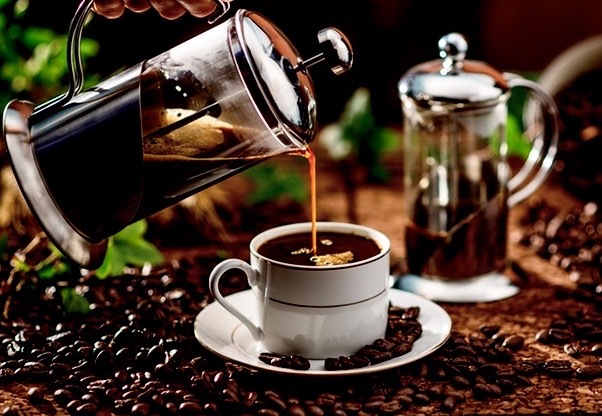 Targeting this depression, we pour just enough water to wet all of the coffee, or double the initial dose plus five grams, then rest for 45 seconds to complete the bloom process. We continue pulse pouring slowly, starting in the center and moving out towards the rim in concentric circles, finishing back in the center until the desired volume of water is reached. We keep the flowing water about ¼" away at all times and try to maintain a consistent flow rate throughout, aiming for an extraction between 3 and 4 minutes. We generally use a grind setting between fine and medium with the consistency of table salt. The V60 is a cone-shaped dripper with spiral ridges along the inner wall with a single opening at the bottom. This design keeps the filter from sticking to the walls of the cone, encouraging extraction at the bottom and sides of of the filter. Manual coffee-making methods are becoming an increasingly popular option for home enthusiasts and coffee shop baristas alike. The french press is easy to use and its results are incredibly consistent. It was invented in 1929 and its well-engineered design hasn’t changed dramatically since then. The french press is perfect for making multiple cups of flavorful, heavy-bodied coffee in just 4 minutes. Our french press process starts with adding our freshly ground coffee into the glass carafe. We then wet all of the grounds and fill the carafe with the proper amount of water based on the desired cup size. Once the first drop of water hits the grounds, we start our timer. We continue adding water and try to agitate the coffee while pouring and stir it well to encourage an even extraction, which helps to release any CO2 gas. When pouring and stirring is complete, we place the plunger into the carafe, press down just enough to create a seal, and wait for the remaining four minutes to be complete. Once the timer goes off, we plunge, pour, and serve, producing a very clean, strong cup of coffee. We generally use a coarse grind and aim for an extraction time of four minutes. A clean and elegant glass chamber design, the siphon method was developed in the 1840s and continues to produce crisp, flavorful cups of coffee today. Throughout this process, the coffee’s aroma becomes trapped inside the globe mechanism which influences flavor and produces a clean, crisp and vibrant tasting coffee that can’t be replicated by a drip brewer. Our siphon method begins by heating water in the lower chamber using a halogen light or open flame. As the air heats and expands, the water in the lower chamber is forced upward into the top chamber where it comes into contact with the fresh coffee grounds. In the top chamber, the water remains for two minutes at an ideal brewing temperature to provide an even extraction of the grounds for optimal taste. Once the two minutes is up, we remove the heat source, which causes the air to shrink as it cools, thus, creating a vacuum that pulls the brewed coffee through a filter to the bottom chamber, creating a beautifully unique cup of coffee.